The Lawrence Hall of Science is one of the country’s only science centers that is part of a top-tier, public research university—the University of California, Berkeley. This Hall engages world-class scientists, engineers, and educators in developing and disseminating the most innovative and effective STEM programs available today. Every year, the Hall reaches more than 12 million young people around the world with STEM learning experiences that inspire them through the same practices and activities that scientists and engineers use in their work. Half of the schools that visit the Hall receive Title I funding. We also engage thousands of educators, nationally and internationally, in high-quality professional learning programs. Further, we increase access to science learning through digital tools for students and educators. The Hall’s portfolio of programs is diverse and far-reaching, contributing to the local and national agenda to inspire, prepare, and diversify the STEM workforce. Your participation in this event will directly support the delivery of innovative STEM learning and will help the Hall increase access to STEM education locally and globally. You will also have the opportunity to invest in the Hall’s new Inventors’ Lab to help ensure that invention, ingenuity, and innovation stand front and center for current and future generations. 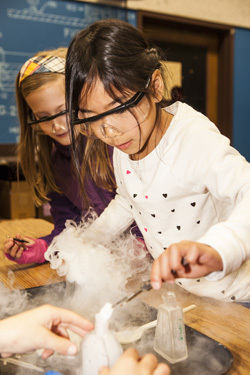 The Inventors’ Lab is a place at the Hall where youth and adults from diverse backgrounds can explore, investigate, discover, and invent; engage in project-based learning experiences that put their ingenuity and creativity to work; and use technology, specialized equipment, and practices used by inventors, engineers, designers, and scientists. Educators and curriculum designers will use the Lab to learn how best to support learning about innovation and invention, as well as how to help learners maximize the value of their experiences in the Lab. The research, development, and professional learning experiences in the Lab will ensure that the work that takes place in this Lab will have an impact far beyond the visitors served.